Route 66 Texas, Sites Along Route 66 in Texas. A vintage photo taken on "The Mother Road"
In the 30s, Route 66 more or less followed the rails. It became the evacuation route for displaced farmers during the Great Depression, but otherwise it remained under-used until the 1950s when the post-war boom forced it into full bloom. 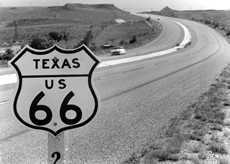 Then the U. S. Interstate system was built and soulless I-40 drained the lifeblood from the smaller towns and businesses on Route 66. Twenty-some years after being officially deactivated, interest in the highway continues to grow. It is, by far, the most celebrated highway in the world. Pilgrims are magnetically drawn to the seemingly endless ribbon of road, sky and prairie from all over the world. Peeling paint, weather-cracked driveways and chipped Formica viewed through streaked glass give visitors the feeling they're visiting a lost civilization and that's not too far from the truth in many cases. The road today can be thought of as a sort of open-air museum. Percentage-wise, Texas hosts a relatively short length of the road. From the Oklahoma line to the New Mexico line is a mere 178 miles, but surprisingly 90% of the original highway remains. 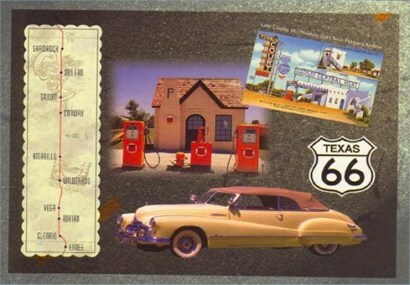 Texas can also claim the Route 66 halfway point. Depending on one's philosophy on travel, entering the town of Adrian means your trip is either happily half-completed, or sadly half-over. Amarillo, may be the only Texas city mentioned in the famous song, but the smaller towns of Adrian, Alanreed, Lela and McLean are certainly doing their bit for preservation. Delbert Trew of Alanreed is the man to talk to regarding Texas 66. His weekly column can be read in the Amarillo Globe and selected columns are available here in Texas Escapes He can often be found sharpening the exhibits at the Barbwire Museum.